In the 2018 Ovum RAN (radio access network) vendor market review report, I rated Nokia as having the best competitive position. The two axis I ranked Nokia and its competitors across, were breadth of portfolio and global reach. While some competitors can match Nokia on one of those axis, no vendor equaled Nokia’s position across both axis. Breadth of portfolio starts with base station offerings but goes beyond just that. Nokia, along with Ericsson and Huawei offer a wide range of macro and small cell option. Nokia, however, also has the in-house capabilities to provide an operator a full end-to-end network. 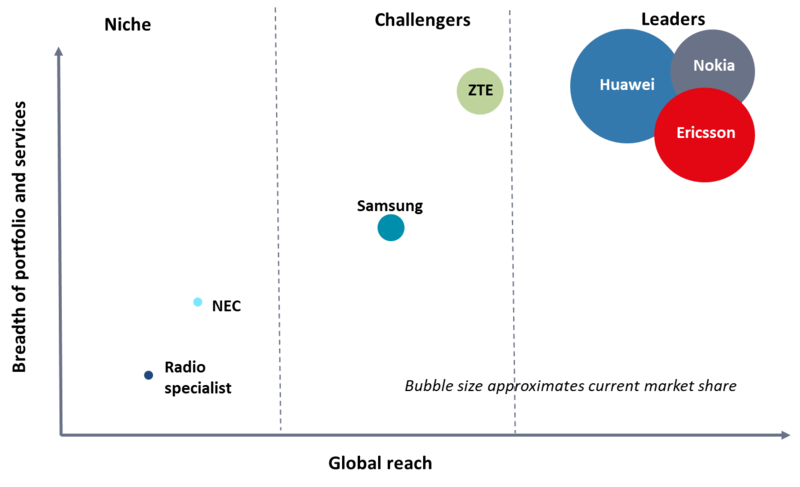 Huawei has similar capabilities, but Ericsson uses partners for full end-to-end requirements. Nokia will agree with me that many networks are not singled sourced end-to-end. However, that doesn’t negate end-to-end as a strength. Having end-to-end assets gives a vendor credibility in talking about how to integrate a complete network in all its complexity. Especially as operators start deploying network slicing. And, there are time to market benefits from single source as well. Nokia further stands out from its major competitors when it comes to openness. The company has been proactively addressing the increased interest in open RAN. Whereas its larger competitors have taken a wait-and-see approach. Part of this has been driven by the company’s own experience in connecting Alcatel-Lucent radios to Nokia base band units. Nokia has deep expertise by integrating more than 1 million radios in total. Open RAN operator engagements include NTT DoCoMo and Verizon. Cementing the vendor’s commitment to open RAN, the company is a member of the O-RAN Alliance which is a merger of the XRAN Forum and C-RAN Alliance. This gives Nokia a voice in how the interfaces between base station radios and base band units are standardized. Now the company doesn’t believe open RAN solutions are going to become the dominant RAN choice but does think there is a role for it. Like small cells; small cells didn’t replace macro cells but were used instead to complement the existing macro network. The company sees a role for open RAN solutions in supporting specific applications and deployment scenarios. Nokia wants to make sure it can support all mobile operators no matter their choice between traditional and open RAN offerings. Breadth of global reach speaks to a vendor’s ability to sell into different markets. We have seen the importance of this recently as Huawei and ZTE have found themselves blocked, either officially or unofficially, from bidding on new 5G contracts in certain countries. This obviously limits markets where a vendor can compete no matter the quality of its kit. Revenue growth prospects aren’t helped by these sorts of things either. Nokia does not have this problem, nor does Ericsson, when it comes to being denied access to markets. Nokia can compete in any market it wishes. With Nokia’s breadth of portfolio and global reach, Ovum believes most operators will take Nokia under consideration when looking at equipment vendors for their 4G and 5G networks. Daryl is Ovum Practice Leader responsible for Next Generation Infrastructure. His research focuses on RAN, small cells, and carrier Wi-Fi where he closely follows LTE and 5G developments. He is a fan of microbrews, mountain biking and music.